By 2021, robots will have a growing presence in healthcare. That doesn't mean less Nursing positions, but more assistance and safety. Think of robots used to detonate bombs instead of sending in a human to do it. 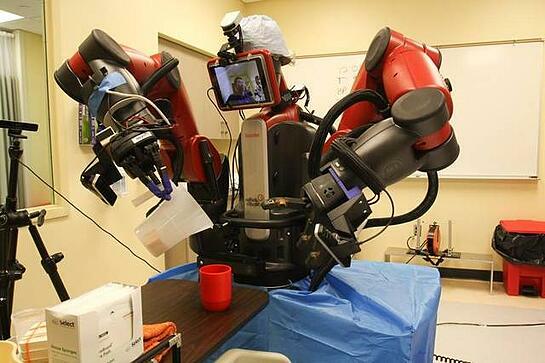 These robots would be dealing with high risk patients with infectious diseases. They can also help Nurses with lifting patients and heavy objects, and they can handle the staffing. Does this sound like a good idea to you? Would you feel comfortable implementing robotics into your work place? A grant from the National Science Foundation has led engineering and nursing students at Duke University to create a robotic “nurse” to assist human nurses, according to an article published in the News & Observer. The robots are being tested as “alternatives to human contact to diminish risks for providers,” who are caring for patients with infectious diseases. “We are not trying to replace nurses,” Margie Molloy, an assistant nursing professor, said in the article, explaining they are trying to create a safer environment for healthcare providers. The first-generation robot called “Trina” (Tele-Robotic Intelligent Nursing Assistant) can perform tasks, albeit clumsily at present, such as delivering a cup, a bowl, pills and a stethoscope to a patient. Its face is a computer screen on which an actual nurse’s face appears. In the fall, students conducted a simulation with a fake patient using the remote-controlled robot, which has a price tag of $85,000. Plans for the next generation of Trina include giving her a “more friendly and human-like appearance” and enabling her to collect and test fluids, the article stated. “We need to establish a better interface with the human and the robot to make them work together and be more comfortable,” Jianqiao Li, engineering student, said in the article. A Business Wire article stated that by 2021 robots will be a growing presence in the healthcare system, surpassing 10,000 units annually. MIT has been teaching robots to assist nurses with scheduling. A robot can observe humans working on a labor and delivery floor and then formulate an efficient schedule for staff, according to the July 2016 MIT News article. Nurses’ positive comments about the robot included that it would “allow for a more even dispersion of workload” and that it would be helpful to new nurses who are acclimating to their roles. Another robot project funded by the NSF is developing robots to help nurses lift patients and heavy objects.